What is the Basic Service Charge found on my water bill? The CPWA charges a quarterly basic service charge to all customers. This charge is separate from usage charges and is a fixed charge based on meter size. The charge covers costs that are the same or similar for all customers, including the cost of eventual meter replacement, the cost of customer billing and repayment of debt on infrastructure. My bill says I have an intermittent or continuous leak. What does this mean? Most of the water meters in the CPWA system have leak detection built in. Every 15 minutes, the meter determines whether there was water use within that interval. If the meter sees usage in at least half of the 96 15-minute intervals in a 24-hour period, it will indicate an intermittent leak. The most common cause of this is a toilet that is slowly leaking water through the flapper in the bottom of toilet tank, causing the toilet tank to refill periodically. If the meter sees usage in every 15-minute interval in a 24-hour period, it will indicate a continuous leak. Common causes are leaks in irrigation systems, water softeners stuck in backwash, or slow drips in faucets. What is the average water use for a CPWA customer? The national average for water consumption for a single person is 80-100 gallons per day. This number drops a little as more people are added to the household, as some water-consuming tasks remain constant, regardless of the number of people (lawn watering for instance). The average quarterly bill of all residential customers on the CPWA system is around 20,000 gallons. What is the hardness of my water and do I need a water softener? The CPWA delivers water to its customers from a number of different sources, so the answer is not the same for every customer. Generally speaking, customers south of Route 146, and all customers in Rexford, receive water from groundwater sources that are high in hardness. The hardness is typically around 290 mg/l, or 17 grains/gallon. High hardness can cause issues with calcium deposits on glassware, flatware, shower doors, furnace humidifiers, fixtures, etc. Customers in this area may choose to install a water softener to alleviate these issues. Customers north of Ushers Road receive most, or all of their water from our connection to the Saratoga County Water Authority. This water is extremely soft and a water softener should not be needed. Customers in the section of the system between Route 146 and Ushers Road may see some varying level of hardness, as both groundwater and surface water sources can converge in this area. If you regularly notice hard water issues within the home, consideration could be given to installing a water softener. If you are in an area where the hardness level may be questionable, you can bring a sample of your water to the CPWA office in a clean container (a bottled water bottle is always a good one) for hardness testing by our treatment plant staff. There are pink stains, or a pink jelly-like substance in my toilet or shower. What is it and what do I do to get rid of it? No, a pink residue is not a problem with your water quality, and is not harmful in this situation. It is evidence of bacteria that are common inhabitants of our environment. The most typical of these bacteria is one known as Serratia marcescens. These bacteria come from any of a number of naturally-occurring sources, such as soil, mulch, dust, and surface waters, and they thrive in an environment that is moist and high in phosphates. More people indicate the problem occurs in the summer months when temperatures and humidity are higher, and especially if windows are kept open for any length of time. Serratia will not survive in chlorinated drinking water. However, where water stands long enough for the residual chlorine disinfectant to dissipate, such as a toilet in a guest bathroom, or on a shower curtain, the pink color may develop. Customers who remove the chlorine from their water by use of an activated carbon filter may also be more likely to experience the problem. How Can I Get Rid of the Stains? Once established, Serratia is difficult to eliminate entirely. However, regular and thorough cleaning, followed by disinfection with chlorine bleach, is the best means to control the organism. Wipe bathtubs, shower walls and curtains, and around drains in order to dry them, followed by spraying or misting with a product that contains bleach or other disinfectant. For toilets, clean the bowl regularly. You may wish to add ¼ cup of bleach to the toilet tank, let stand for 15-20 minutes, and then flush the bowl a couple of times to fully rinse the disinfectant. Bleach should not be left in the toilet tank for prolonged periods, however, as it will damage the rubber seals and valves inside. Use care with any abrasives to avoid scratching a fixture or surface, which will raise the likelihood of bacterial growth. Clean pet water bowls in a similar manner. Leave a bleach solution in the bowl for 15-20 minutes, followed by thorough rinsing. Clean off the pink residue, and then mist with a product that contains chlorine bleach. What causes black rings around the toilet? Black rings around the toilet not only look disgusting, they may also resist regular cleaning techniques using toilet bowl cleaner and a toilet brush. The black ring may also be made up of toxic materials that not only smell bad but put your health at risk. Using the right cleaning materials and techniques will eliminate the black ring. Hard water deposits will accumulate on any surface that regularly comes into contact with your house's water supply, including shower heads, faucet spouts and your toilet's bowl. Water flows from the toilet's tank and into the bowl through series of small holes or ports located under the toilet's rim. Over time, the hard water deposits will begin building not only in the ports, but also around the port openings and the rim of the toilet. The hard water deposits provide a nonslick surface for waste and other grime to accumulate where it will not wash down the drain each time you flush the toilet. Mold will grow in toilets, since the toilet provides an ideal breeding ground. Mold needs a moist environment to stay alive, as well as an organic surface on which to grow. The hard water deposits under your toilet's rim provide a breeding ground for the mold. Mildew grows under the same conditions as mold. Mold and mildew can appear black and will cause respiratory problems for people as the mold and mildew release tiny spores into the air. Sewer organisms live in drain pipes and sewer systems, feeding off the waste in the pipes. During hot and humid weather, these organisms may pass through the toilet's trap and make their way into the bowl. Once in the bowl, the organisms will live under the rim. Each time you flush the toilet, the organisms will release a smell similar to the sewer. Just scrubbing the toilet's tank will not entirely get rid of the black ring in your toilet. If the black ring is from hard water deposits, you will need to use vinegar in the toilet to break up the hard water deposits before you scrub the black ring again. Bleach will kill mold and mildew as well as sewer organisms. In addition to cleaning the bowl with bleach, you need to pour several cups of bleach down the overflow tube in the toilet's tank to clean out the ports in the toilet as well as the area around the ports' openings. Clean the hard water deposits out of the ports by mixing 1 part muriatic acid with 10 parts water, and then pour the mixture down the toilet's overflow tube. Does the CPWA add Fluoride to the water? The CPWA does not fluoridate the water it serves to its customers. There is some naturally occurring fluoride in some of the CPWA’s source waters, but these levels are much lower than what a dentist would recommend for developing teeth. Customer who are concerned about getting enough fluoride for good dental health should consult their dentist. Can I connect my home or property to the CPWA water system? The CPWA has a policy requiring that a property must have water main located immediately in front of, or across the street from, at least some portion of their property. Properties that meet this criterion can connect and are required to complete an application for metered water service, pay the appropriate tapping, hookup and meter fees and have a contractor perform all work necessary to complete the connection from the shutoff on the property to the inside of the home. Properties that don’t meet this criterion are required to extend water main to that location from its existing terminus. There are a couple of ways that this can happen. One way for a resident to extend water main to their property is to present an engineered drawing of the proposed water main extension to the CPWA for review. Once reviewed and approved by the CPWA Administrator, the resident would then hire a contractor to install the water main per the approved plan. The property owner would be responsible to pay all costs associated with the extension, including water main testing, the installation of the service line to the house and any fees due to the CPWA for inspection, connection and meter. Once installed, the water main would become the property of the CPWA, who would be responsible for all future maintenance and repair of this line. The other way that water can get extended is to form a water district. 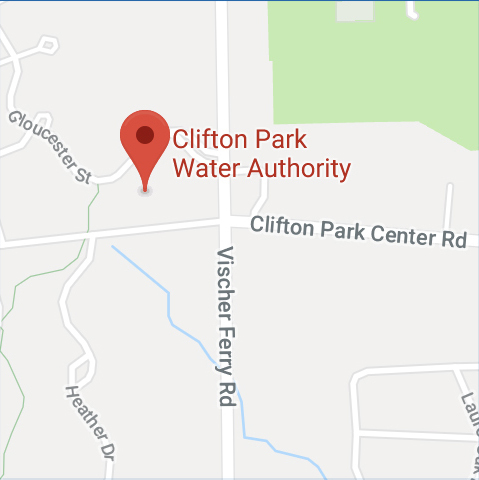 Residents in a given area, that are interested in receiving water service from the CPWA, can petition the Town of Clifton Park to create a special district to extend water service to their homes or properties. The creation of a special district allows the Town to finance the project over an extended period of time and recover these expenses annually on the tax bills of the properties within the limits of the special district. This spreads the cost out over a long period of time and makes it more affordable to the property owners requesting water service. Once the petition is received by the Town, their engineer would determine the cost and feasibility of the extension and present these findings to the property owners within the proposed district area. At that time, the property owners will each decide whether they are willing to incur the costs associated with the project. The percentage of property owners within the district area that are willing to commit to the expense will determine whether the project proceeds or not. Property owners within the special district area can expect to pay annually on their property taxes for the cost of installation of the water main until the bonds are paid off in full. They can also expect to pay for installation costs of the water service to their home from the newly installed water main, as well as any hookup and meter fees due to the CPWA.